Our group was made up of 10 people with 1 to 3 degrees of separation. Our connections could be broken down into three basic groups: med students, people who studied abroad together in Cape Town, and currently living in Lesotho. I really enjoyed getting to know everyone. We laughed A LOT, even when it hurt from lack of oxygen. Thanks to Andrew who has been living in Moshi we had an awesome guiding company – Gladys Adventures – and lead guide – August. I can say without exaggeration that I would never have made it to the top without August. He stuck with me in the back and encouraged me to keep going. If you are considering climbing I would absolutely recommend both Gladys and August. Days 1-4 and 6 were totally manageable hiking days. 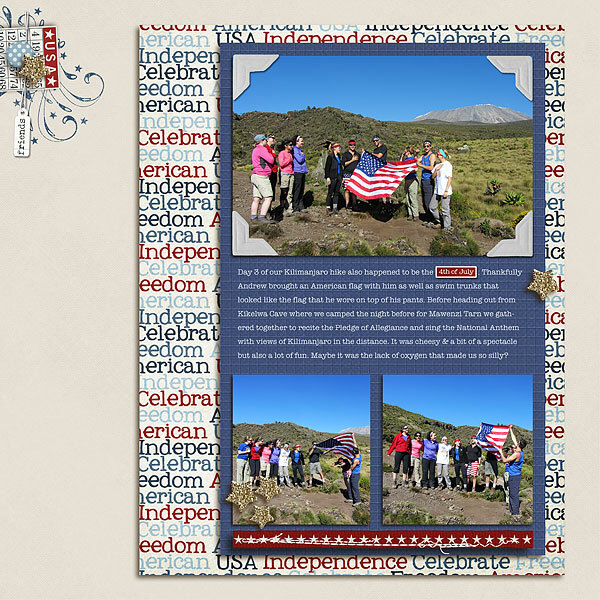 I would love to do another multi-day hike and even up to the altitude of Kibo Hut (aka Base Camp at 15,400 feet ASL). I can say with a lot of certainty, though, that I have no intention to summit a 19,000 foot mountain again in my lifetime. I knew logically that being above a certain altitude would make it difficult to breathe but had no idea how that would actually play out physically. WHOA. At Kibo Hut it winded me just to climb out of the tent. Summiting would not be nearly as difficult if you were getting more oxygen with every breath. August has gone to the top 275 times (and one time in 14 hours round trip as part of a porter/guide race), I can’t even fathom that. One thing that I consistently read about before going was that the guides would encourage you to go “pole pole” (which means “slowly slowly” in Swahili.) This was definitely my strategy and I feel that it helped me get to the top because 1) was used to being in the back of the group so I didn’t feel pressure to go faster and 2) I was able to go at a very consistent speed and not burn out. 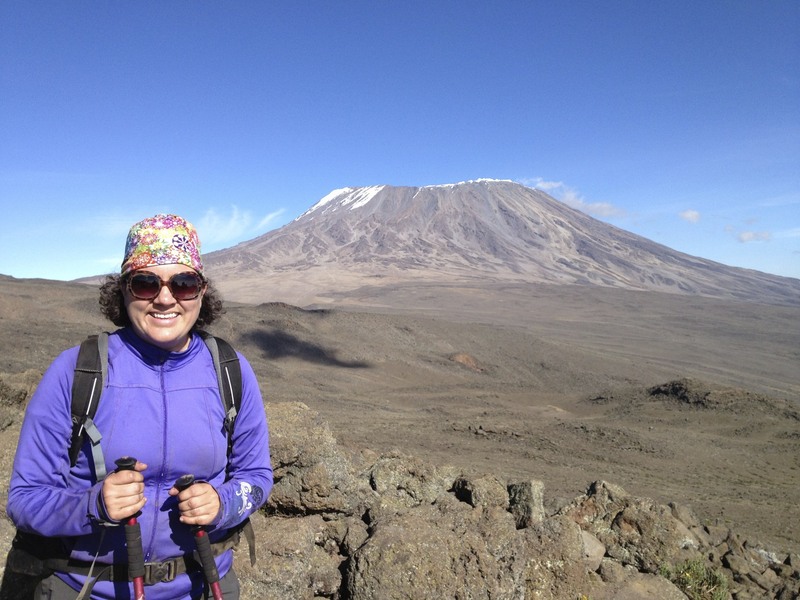 I didn’t feel significantly worse at Uhuru Peak (the very top) than I did at the first major summit point (Gilman’s Point) while others in my group were definitely struggling more. 7 out of our group of 10 made it to the top. We lost one to bronchitis at Kibo Hut, one to altitude sickness during the first couple of hours of the summit and one fiancée of the person with altitude sickness. Summit day is the most physically demanding thing I have ever done in my life. Due to nerves I had about an hour of sleep, we started hiking at nearly midnight and I got back to Kibo Hut at 11:30am. In those 11 hours we climbed about 6.5 miles of distance (round trip) and went up and down 4,000 feet in altitude. Summiting during the full moon was so cool. I could have done most of the trail without a headlamp, but used one just to be cautious. Because of my balaclava I couldn’t look up very well, but there were moments where I’d get glimpses of what felt like a spotlight shining down on me but was really the full moon. Very cool. Our camps on Days 2, 3 and 5 had the most amazing views of the tops of the clouds. The sunsets in particular over the clouds were stunning. I’ll also never forget the moment on Day 6 when all of a suddenly the clouds were above us again. Indescribable. I am writing this just less than 24 hours from when I crossed at Marangu gate back into “real life.” Currently I am sitting poolside at the Sal Sanero Hotel in Kilimanjaro and listening to awesome 90s ballads (currently playing “When a Man Loves a Woman” by Michael Bolton) hoping that the masseuse will show up for massages this afternoon. 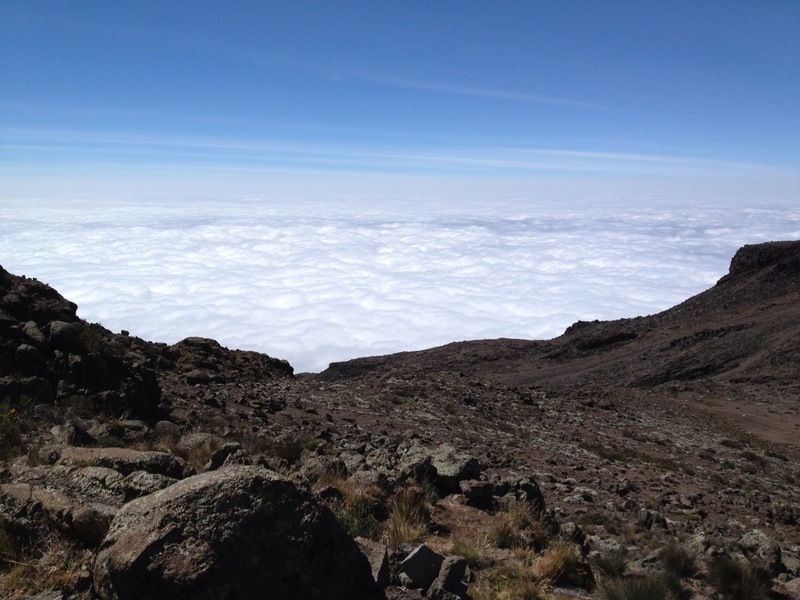 There is a lot to be said about my Kilimanjaro experience that will be written here in the coming weeks. For now, I wanted to let everyone who isn’t on FB and may be following along that I made it back safe and sound (and also a day earlier than I expected as I learned on day 1 that we were doing a 6 instead of 7 day trek). The only way I can summarize the experience is to say that it was a once in a lifetime experience. Summit night is one of the hardest things I’ve ever done. EVER. Physically, emotionally, psychologically etc. In a way I am still reeling from the experience and wonder if my toes will ever look the same considering the gigantic blisters I have on both big toes. 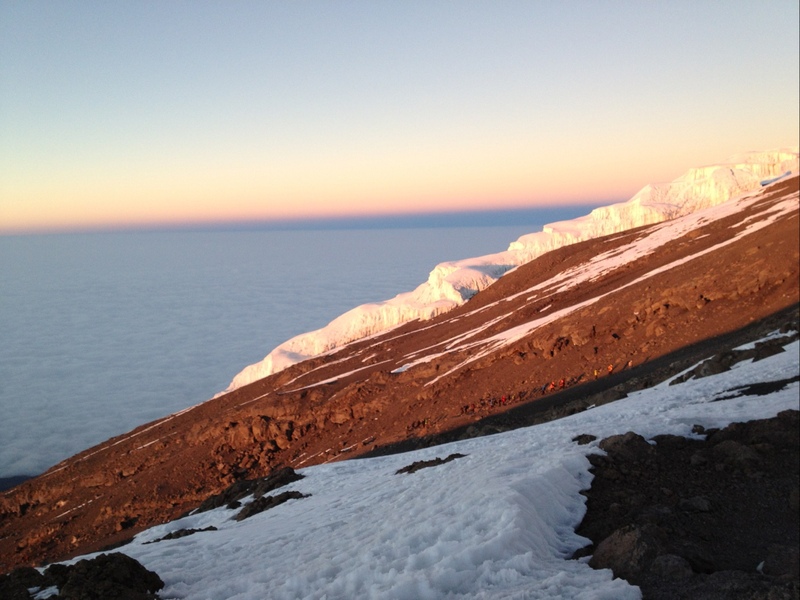 For now enjoy this image of sunrise off the glacier between Stella Point and Uhuru Peak. More to come. When you see the full moon next week this is what I’ll be looking at. Starting tomorrow I’ll be offline completely while I climb Mount Kilimanjaro for 7 days. I haven’t been completely offline in … Hmm, I can’t think of a time in recent history that I’ve been completely offline. Since Peace Corps? Let’s just say that both my boss and I are kind of freaked out about it. 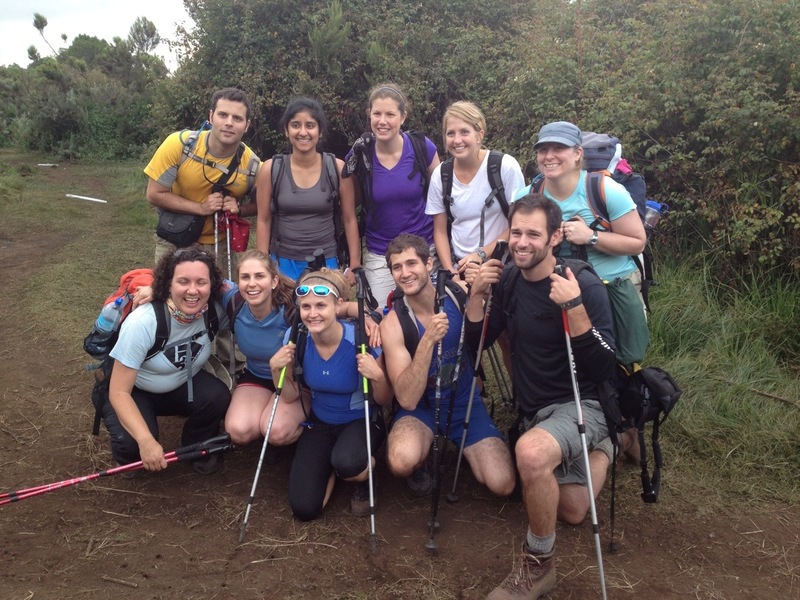 Climbing Kilimanjaro is on my 17 Before 2017 list, but this trip happened to fall into my lap when a new colleague (Bhavya) told me during her first week on the job that she was planning to do the climb with friends in June/July. I told her about my list and she invited me to come along. Now it’s actually happening. We’re going with one other friend from Maseru (Katie) and 3 friends of Bhavya’s. Thanks to the musical I haven’t done as much training as I hoped to, but deep down I feel confident that I’ll make it. Plus you can’t train to avoid my biggest fear – high altitude sickness – that everyone says that it effects people differently and no matter their fitness level. I’m hopeful that: 1) already living at an altitude of 1,500m, 2) I successfully (altitude-wise) hiked at about 2,500 – 3,000m for 12 hours earlier this year and 3) I’m just a generally slow hiker will give me some benefit. We are timing our trip around the full moon – so keep an eye out for it next week and think of me on Kilimanjaro. 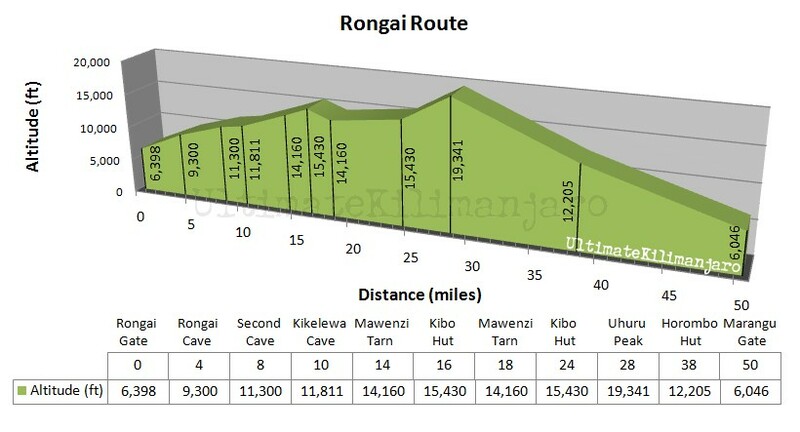 I’ve copied our itinerary below for the Rongai route (follow the link for an image of the route map), but we’re taking an extra day before summit to get better acclimated to the altitude and improve our chances of making it to the top. After completing the necessary registration formalities at the Marangu Gate, we transfer by 4WD vehicles to Nale Moru (1,950 m.) to begin our climb on this unspoilt wilderness route. The first day is only a half-day walk on a small path that winds through farmland and pine plantations. It is a consistent but gentle climb through attractive forest that shelters a variety of wildlife. We reach our first overnight stop by late afternoon at the edge of the moorland zone (2,600 m.). The morning walk is a steady ascent up to the ‘Second Cave’ (3,450 m) with superb views of the Eastern icefields on the rim of Kibo, the youngest and highest of the three volcanoes that form the entire mountain. After lunch, we leave the main trail and strike out across the moorland on a smaller path towards the jagged peaks of Mawenzi, the second of Kilimanjaro’s volcanoes. Our campsite, which we reach in late afternoon, is in a sheltered valley near Kikelewa Caves (3,600m). A steep climb up grassy slopes is rewarded by superb panoramas of the Kenyan plains to the north. We leave vegetation behind close to Mawenzi Tarn (4,330m), spectacularly situated in a cirque beneath the towering cliffs of Mawenzi. The afternoon will be free to rest or to explore the surrounding area as an aid to acclimatisation. Day 4 We leave our attractive campsite to cross the lunar desert of the ‘Saddle’ between Mawenzi and Kibo to reach Kibo campsite (4,700 m) at the bottom of the Kibo Crater wall by early afternoon. The remainder of the day is spent resting in preparation for the final ascent before a very early night! We will start the final, and by far the steepest and most demanding, part of the climb by torchlight at around midnight. We plod very slowly in darkness and cold on a switchback trail through loose volcanic scree to reach the Crater rim at Gillman’s Point (5,685 m). We will rest there for a short time to enjoy the spectacular sunrise over Mawenzi. 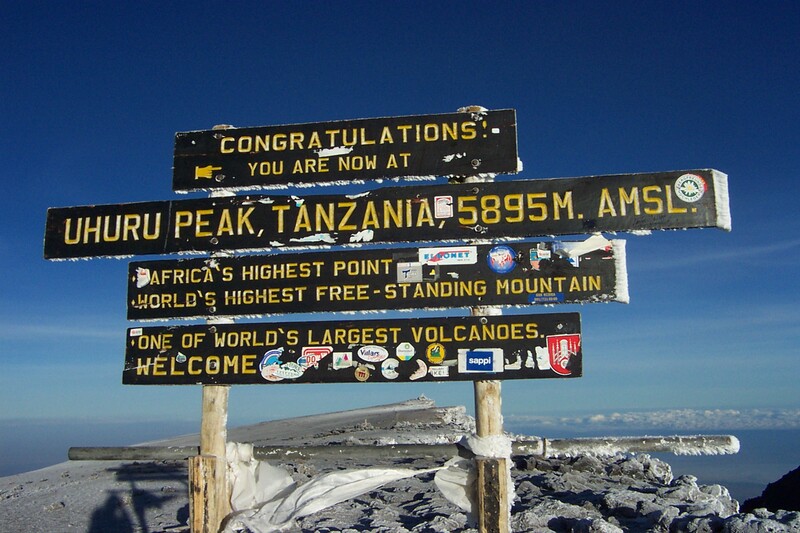 Those who are still feeling strong can make the three hour round trip along the snow-covered rim to the true summit of Uhuru Peak (5,896 m), passing close to the spectacular glaciers and ice cliffs that still occupy most of the summit area. The descent to Kibo Hut (4,700 m) is surprisingly fast and, after some refreshments and rest, we continue descending to reach our final campsite at Horombo (3,720 m). 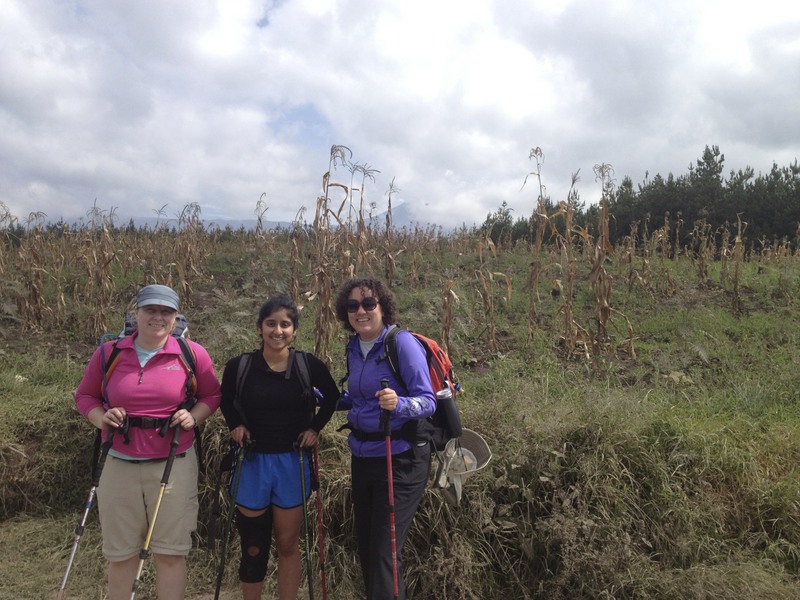 This is an extremely long and hard day, with between 11 to 15 hours walking at high altitude. A sustained descent with wide views across the moorland takes us into the lovely forest around Mandara (2,700 m), the first stopping place on the Marangu route. The trail continues through semi-tropical vegetation to the National Park gate at Marangu (1,830 m). We leave the local staff to return to our local accommodations by mid-afternoon for a well-earned rest and a much needed shower and beer!